Weekend Reading: Queen of Pentacles from the Art of Life Tarot. 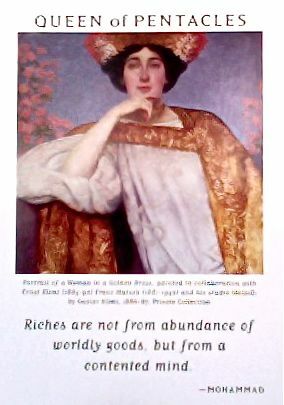 The quote on the card says it all—true riches come from a contented mind. So this weekend put your worries aside and be wealthy of mind. Show gratitude for what you have. And practice being in the moment. In this moment there is so much to be grateful for. In this very moment, there is nothing lacking...no creditor ringing your phone, no child tugging at your pants leg. There is just you and life and the moment. In this moment, you have everything you need to fully, richly, blissfully experience this moment! We spend so much time wishing for riches and alluring new lovers, but the one thing everyone wants more is just to be happy...to be content. The mistake comes in thinking anything of those things can do that for you. Only you can do that for you...by putting aside the things that clutter your mind and just enjoying this one moment of wonderful life. Then another. And another. Can you feel the abundance flowing?